Every July in Milwaukee, Wisconsin, the Great Circus Parade brings circus history back to life. The wagons that rolled down the streets of Europe as well as America 100 years ago to announce that the circus had come to town, roll again. It is a week-long celebration that starts off in Baraboo, Wisconsin, home of the Circus World Museum, where the wagons have been restored and are on public display. Draft-horse teams come from all parts of the country to load the wagons on to vintage flatcars in turn-of-the-century style. The circus train travels across Wisconsin and Illinois for two days and arrives in Milwaukee to a showground set with animal petting zoos, horse tents, bandwagons, and the Big Top. 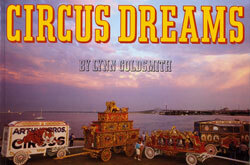 For three days people come to see the wagons and share the circus atmosphere. On Sunday, the seventh day, the Great Circus Parade marches down the main street: 700 horses, 150 wagons, including the spectacular 40-horse hitch, 250 clowns, a kingdom of wild animals escorted by red-coated outriders, scores of brassy wagon-top and marching bands, hundreds of glittering costumed participants - making this one of America's greatest events.